Special attention will be given in this game and coming games to get beyond our "skirmish" tactics and start to use real military tactics and a more violent aggressive approach. Come prepared to hustle and engage the enemy with ferocity. I will be there! And if anyone has a M4 Hi-cap they could lend me/sell me for the game, let me know. Hoping to be able to come play but I'm not positive yet. I'd love to come out and meet the group. I'd appreciate it if someone could fill me in on transportation. I probably need a ride, unless Sean's place is really close to the campus. Tommy someone will be able to pick you up. My house is walking distance but not with gear. Who here can give Tommy a ride? 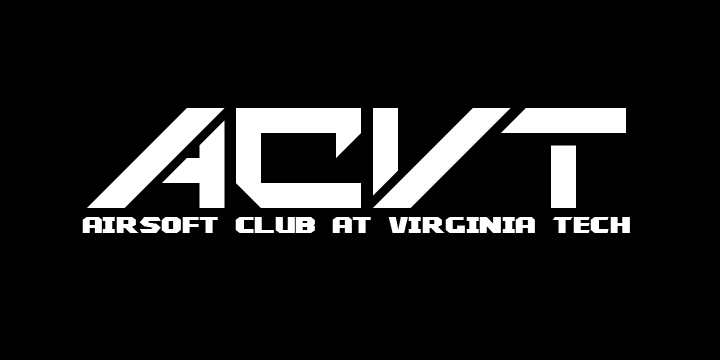 Also, Tommy if you haven't joined the ACVT facebook page what is your full name so I can add you as a friend and ad you to the group? Mine is Sean Mury. The FB group is the easiest way to get rides etc. facebook friend request sent Tommy. Hi, i just heard about this club in the gobblerfest and i am interested in joining the game on this Sunday. I have no equipment and also do not know how to get to the place. so can someone borrow me some necessary equipment and take me there? appreciate! TinaTian wrote: Hi, i just heard about this club in the gobblerfest and i am interested in joining the game on this Sunday. I have no equipment and also do not know how to get to the place. so can someone borrow me some necessary equipment and take me there? appreciate! Need to know if you are you on campus. Someone can definitely pick you up before we head out. The only equipment you'll need is eye protection (preferably actual military style goggles) a hoodie, and jeans. I suggest a hoodie because they tend to be lightweight, full sleeved garments that can absorb some of the BBs energy before it hits (less pain, it's what I did for the longest time). --If you don't have the eye protection, I'm sure someone has a spare lying around. (Myself included). To keep on topic. I should be there. Sean, I assume we're going to have extra waivers at the field? Last time Greg grabbed some. Good idea Matt we will make sure to have some. Also everyone who has extra gear please bring it! I'll be there, I have a new tightbore barrel for my m4 and a new saw to play with, should make things interesting. I'll be there. I'll be driving, so if anyone needs a ride PM me. Thank you very much. I just borrow two eye protections because I have another friend also want to go with me. Could some one just give us a ride from the campus? and please tell us when and where to meet! Thanks again! I'm running by campus to pick up Tommy, I'm sure I could grab a few more. SuperFetus wrote: I'd love to come out and meet the group. i can give you a ride if you still need it. Kyle's got me covered. Thanks for the offer.